Something I look forward to every month is the opportunity to try out five new beauty products for only $10! 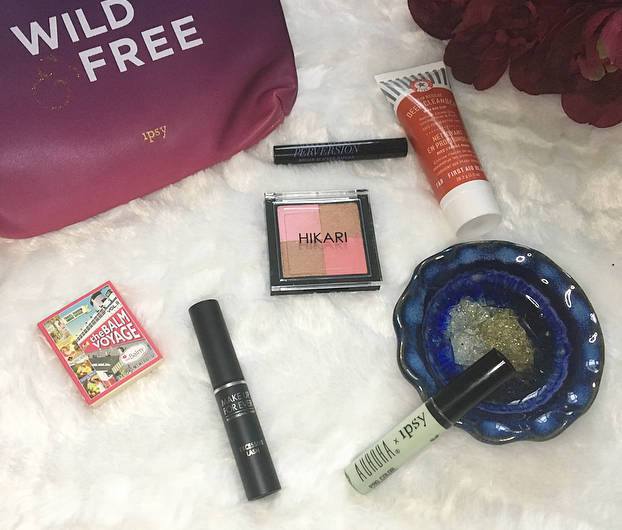 With a mixture of samples, deluxe samples, and full-size samples I have always found the bags worth the money and I have found a lot of products that I love through the Ipsy service. I will admit that I always look at the products I'm going to get before the bag arrives--I'm very impatient! There wasn't anything I was too excited about, but I had used some of my Ipsy points to get a free sample so I was looking forward to trying that out. The packaging of the product this month was different than usual and really pretty. Ipsy bags typically arrive in a hot pink package, but the August bag was sent wrapped in gold. I like the change and it would be cool if it were permanent, but I don't know that it is. The gold packaging matches the bag this month, which is ombre hot pink to purple and says "Wild & Free" on it in white and gold letters with a gold tassle accent. There were a few other bag options this month and I like mine! I've gotten a moisturizer from First Aid Beauty in the past and I absolutely loved it, so I'm curious to see how this cleanser works for me. It has red clay, which I like as a skincare ingredient, but clay can be drying so I may only be able to use this cleanser sparingly. I'm generally not a fan of two-in-one powder products. I prefer my blush, bronzer, and highlighters seperate, please and thank you. However, this blush/bronzer blends together to be a really pretty coral shade that is actually wearable as a blush. I don't think this could work as a bronzer on anyone unless you use eyeshadow brushes to apply your bronzer! I really like the products I've tried from theBalm, but their sample sizes almost always disappoint me. This shadow/highlighter is not as disappointing because I would be able to at least fit my highlighting brush or eyeshadow brushes in this little compact. Kuwakaribisha is a pretty, light gold which is just slightly darker than some of my favorite highlighters, so it looks promising! Despite being a big trend for several years now, I haven't really tried color correcting. I've used pinky tones under my eyes to cancel dark circles, but I've never tried a green product to correct my redness. This little sample has a watery consistency and a concealer applicator, and it blends away easily into the skin and leaves only a slight green tint that could easily be covered up with foundation or concealer. I think I will try this the next time I have a blemish and see if it cancels the redness! I'm not sure what I'm going to do with this product. I have about seven or eight mascaras on backup that I want to use, and this brush doesn't look like one I would like. Make Up For Ever also isn't cruelty-free, so I am hesitant to try something from them. I think I will give this to a friend instead. I had a few Ipsy points waiting for me to use and I like to spend them on products that I am really curious about. I've heard good things about Urban Decay's Perversion mascara in the past so I decided to pick this out of the other options! I forget how many points this was, but I'm hoping it wasn't many because this sample size is pitiful. It's really, really thin and small and will probably dry out in a week. I will still get a few uses out of it, and I'll be happy to finally test it out, but I hope I didn't waste my points on it. Overall this wasn't my favorite bag, but I will try out most of the products and I'm hoping they work out for me. I'm pretty excited about the color corrector, the formula seems really good, and the cleanser from First Aid Beauty, which is a good travel size. Also I want to mention that I recently had a blog makeover! I finally purchased my own template from Etsy and I love the subtle watercolor effect. I also made a new header and I'm looking into getting a domain name. It was a bit of a difficult process. If you visited my blog between 10 and 11 pm EST on Tuesday you may have seen was a mess it was! Anyway, I got it all figured out and I'd love to hear your thoughts on it. Have you tried any of these products? Would you want to? 13 comments on "August Ipsy Bag Review"
Nice box! I love to see these kinds of posts, I'm always curious to see what people got in their monthly subscriptions boxes ehehe! I have the red clay cleanser from FAB and I really liked it, it's something I would for sure repurchase! Great post! So cool you got the new blog template! Lovely products you got! Oh wow!! this looks so good!